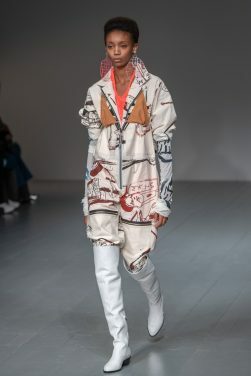 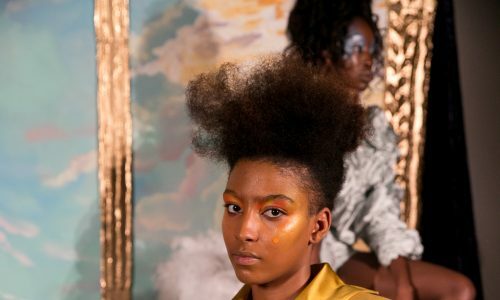 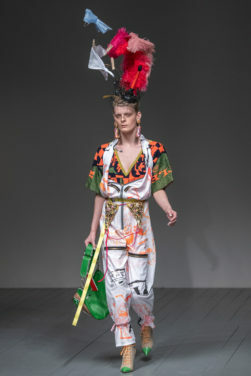 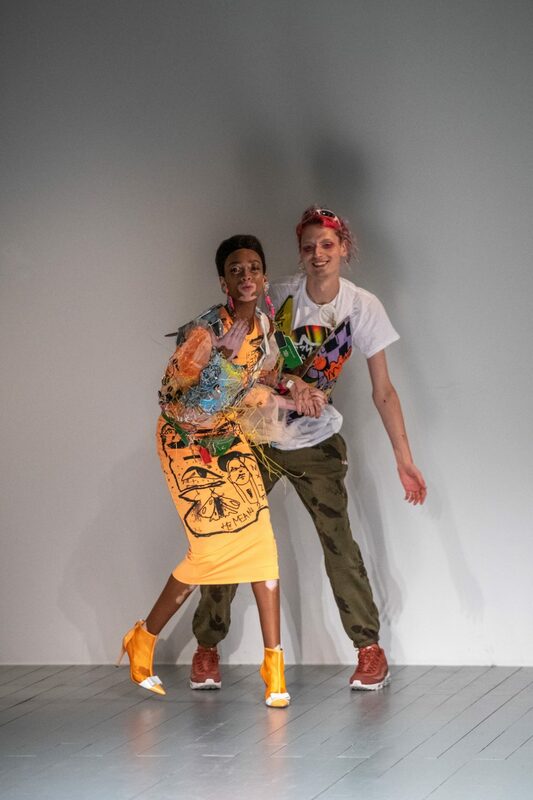 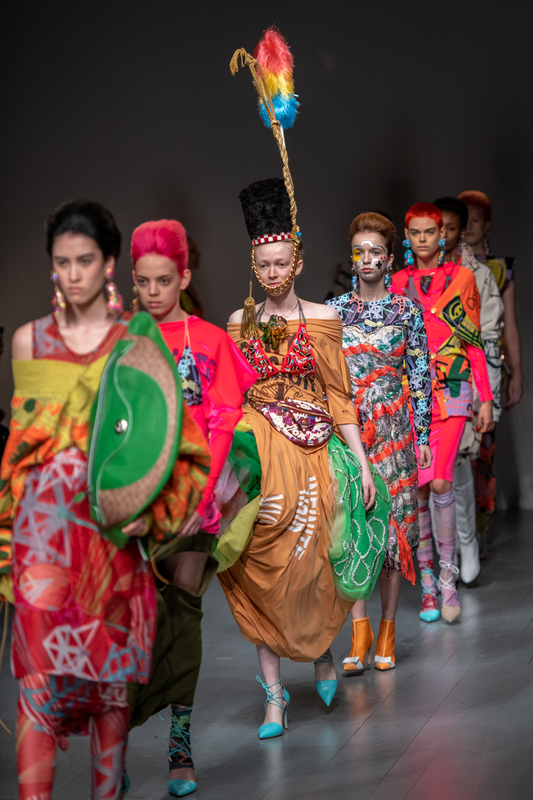 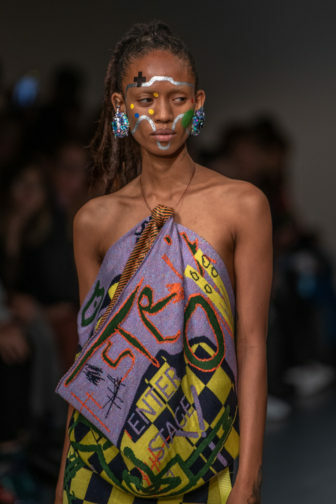 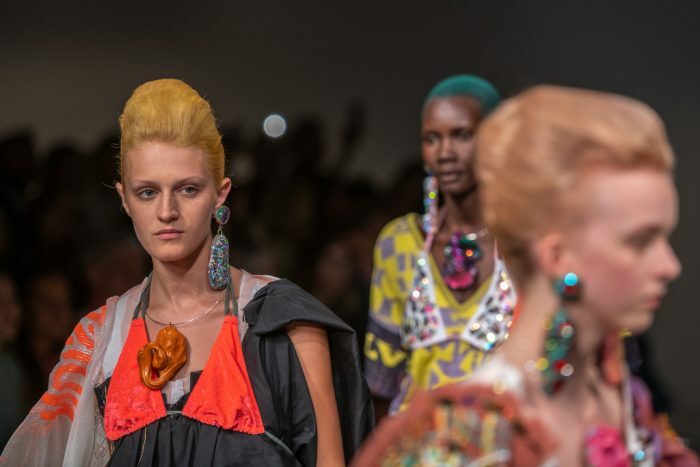 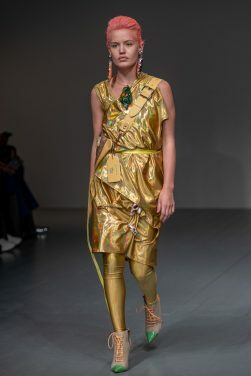 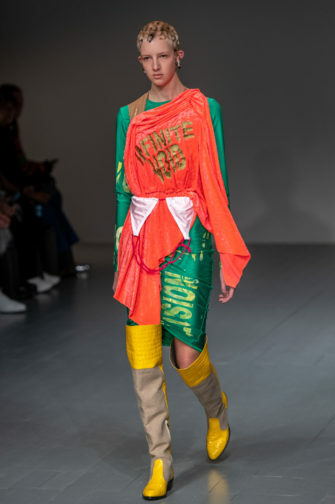 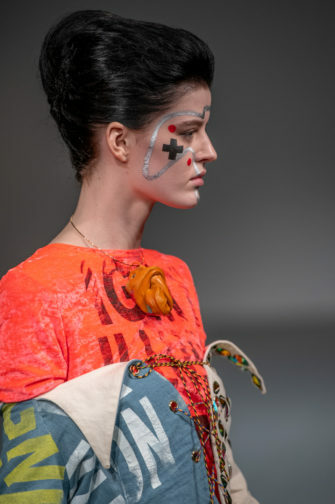 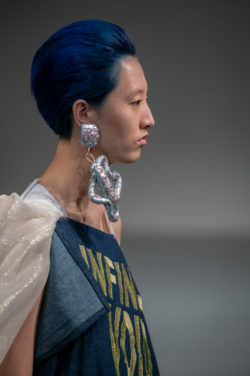 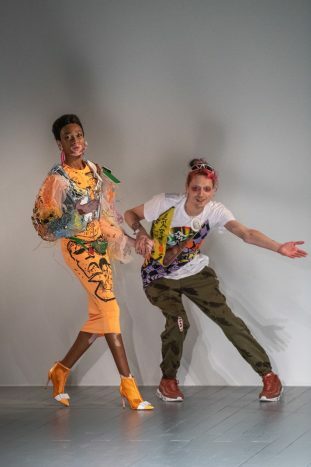 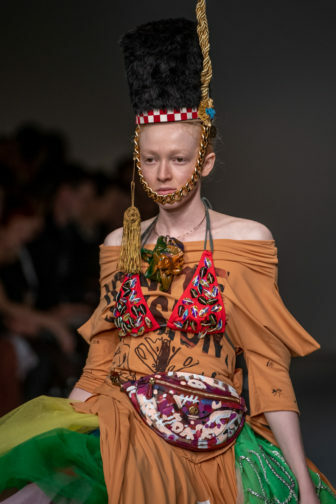 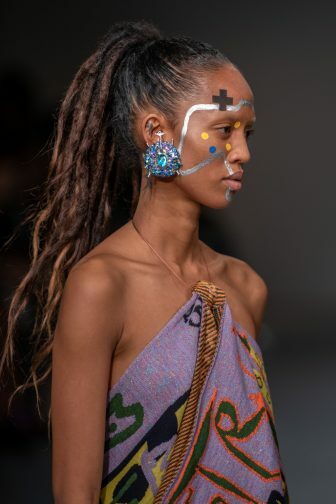 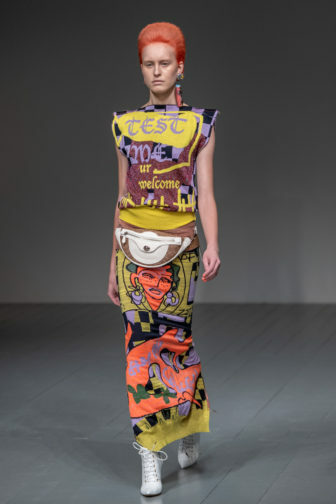 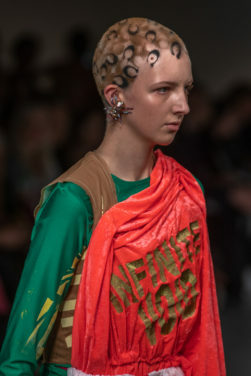 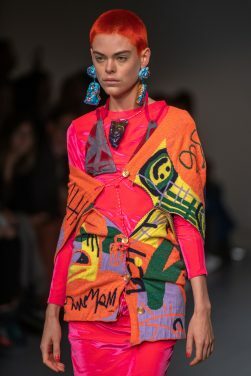 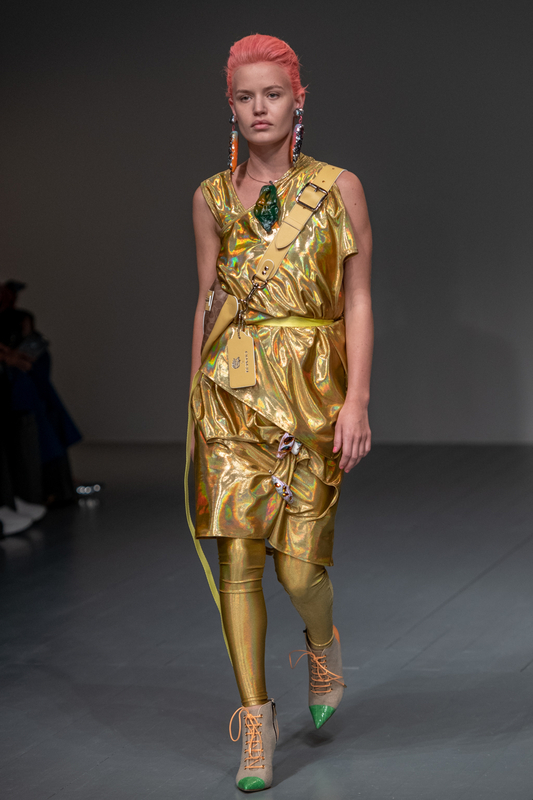 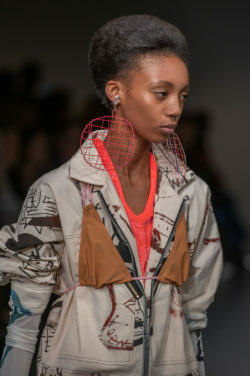 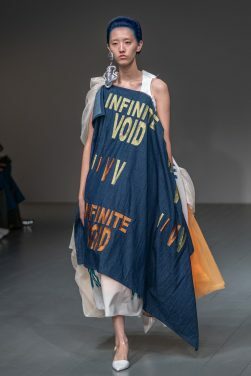 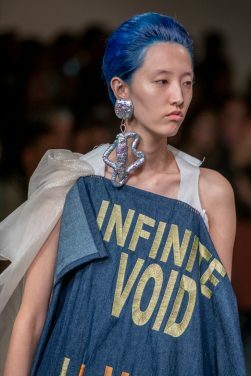 The alluring chaos that allows us into the curiously creative mind of Matty Bovan was as tenacious as always with his SS19 collection. 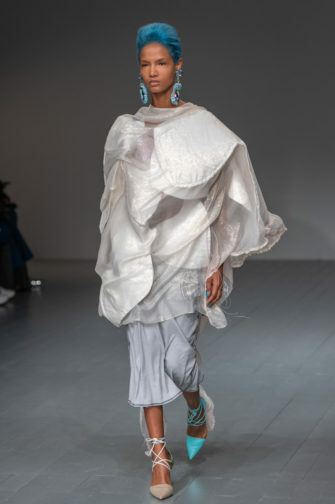 The effect Bovan’s ingenious designs have on the viewer make you question the breadth of possibility within the realms of fashion. 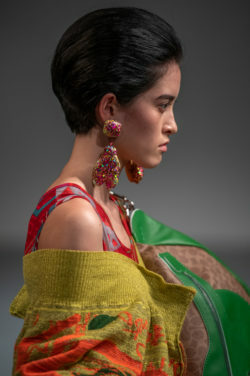 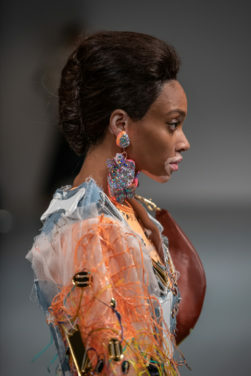 His aggressive craftiness – conveyed through scribbles of multi-coloured cable-ties, generous bundles of jersey, knit and hessian fabrics, holographic cellophane and everything in between – managed to make even first-time witnesses instantly familiar with the designer’s technique. 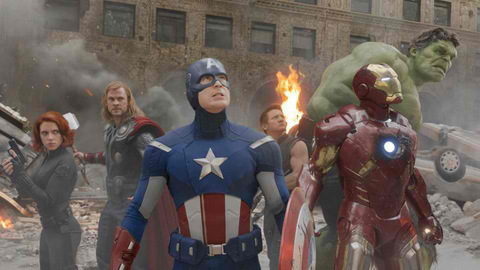 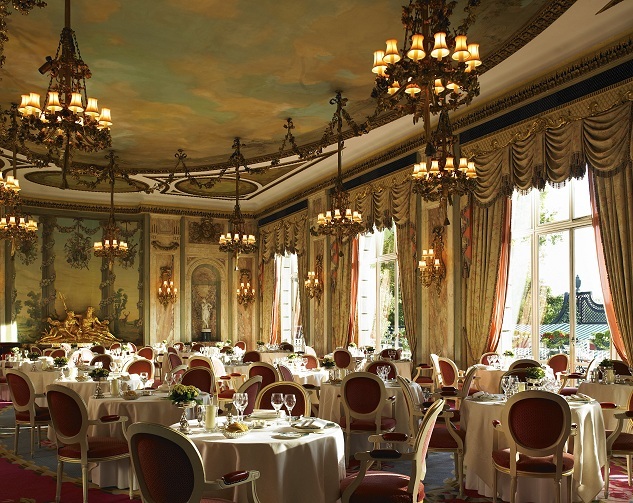 Only for a second could one think that the designs were verging on “tacky”, before veering more towards sheer brilliance. 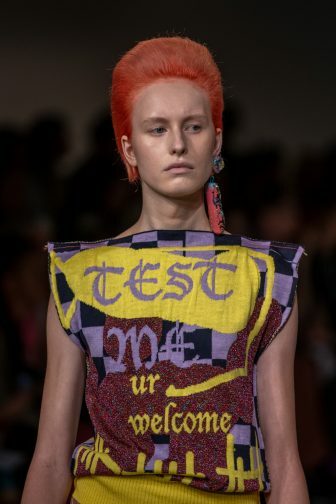 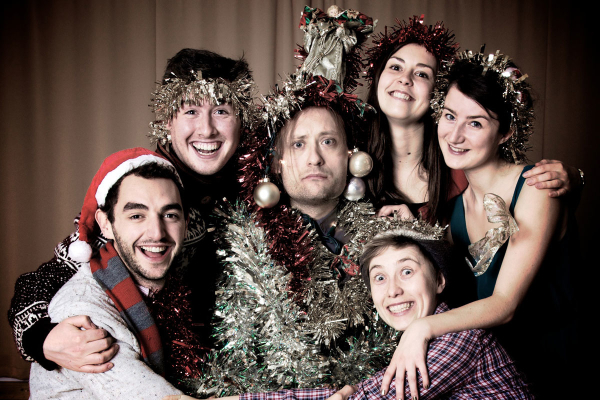 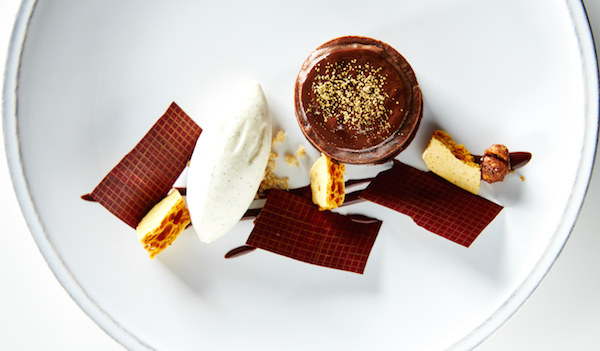 As Bovan explained, he is “still testing the limits of taste”. 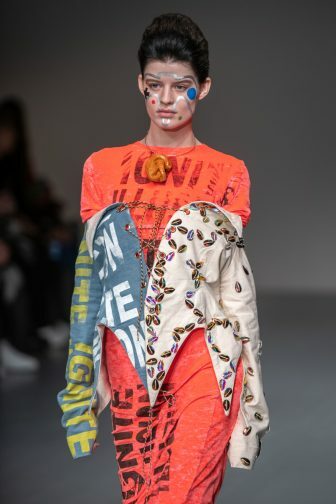 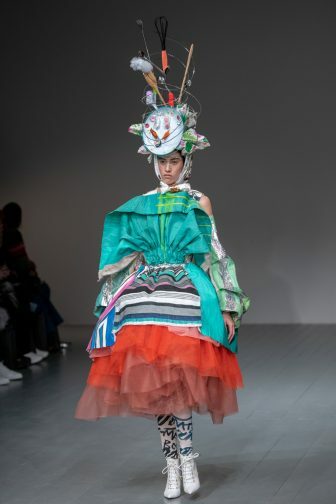 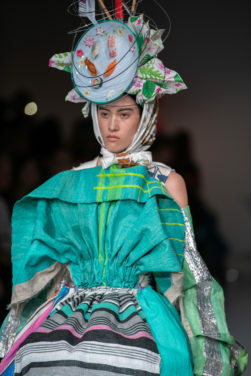 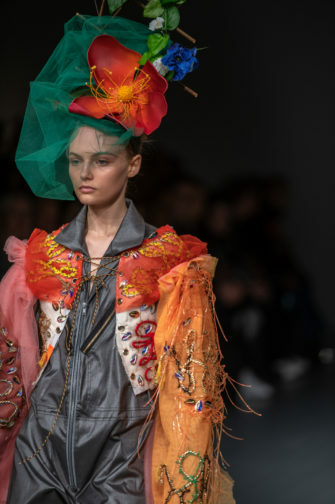 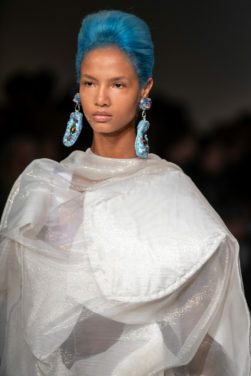 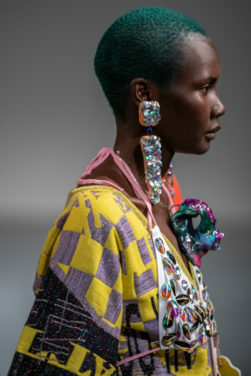 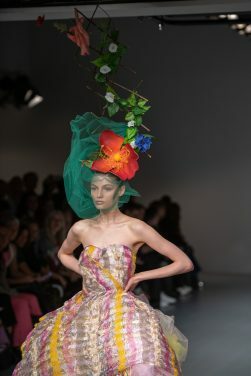 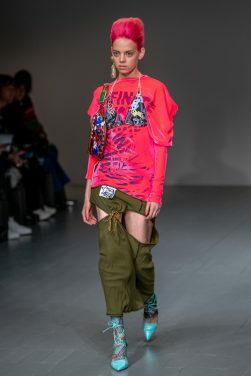 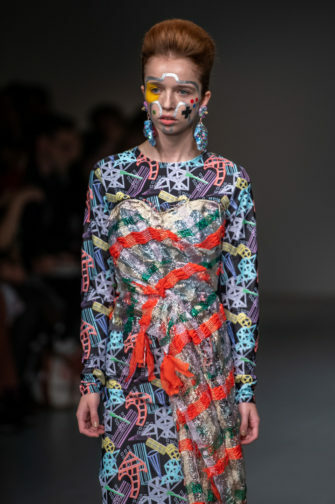 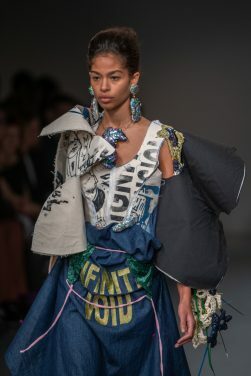 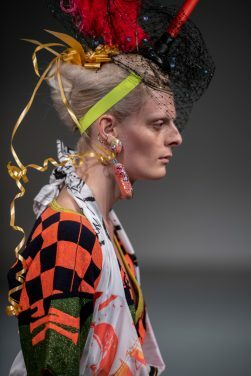 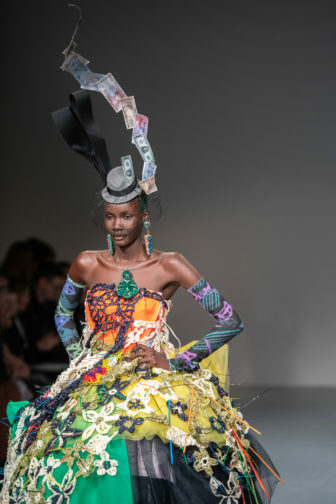 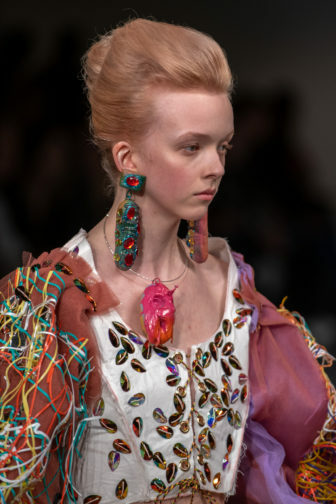 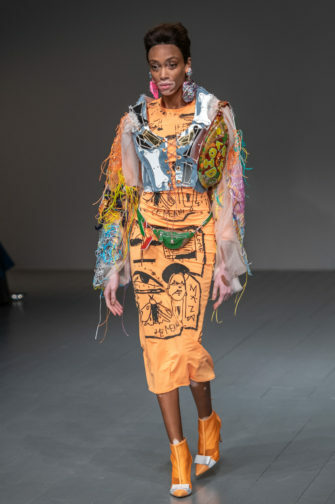 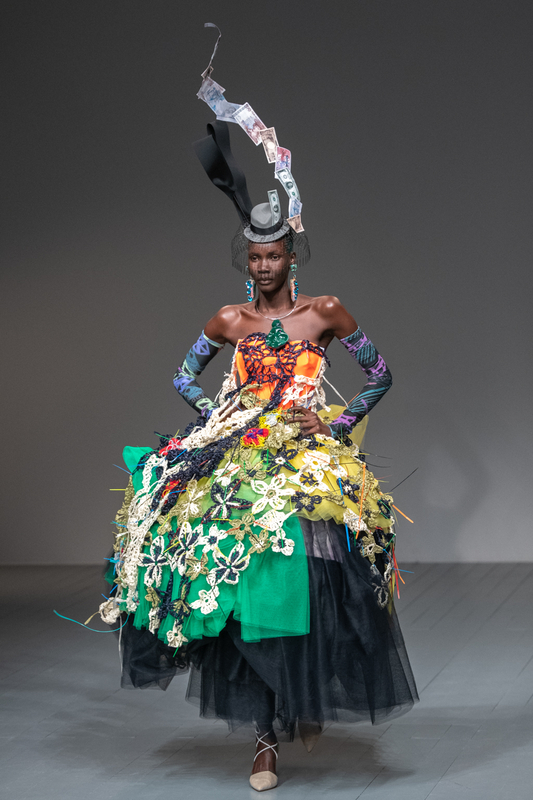 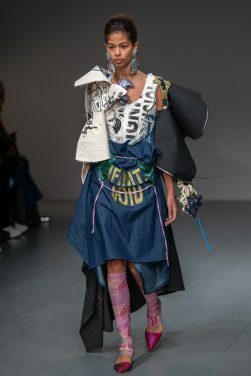 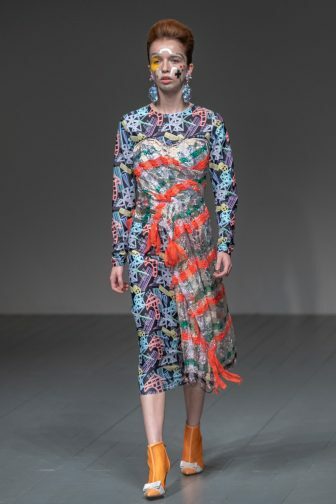 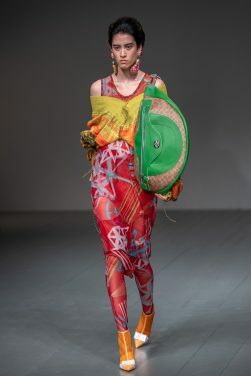 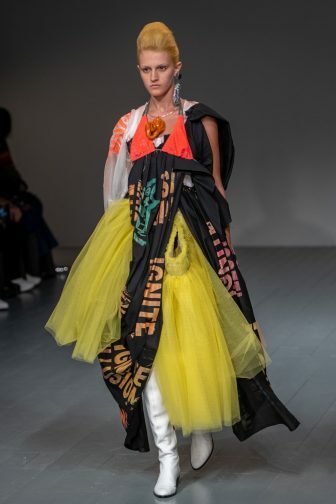 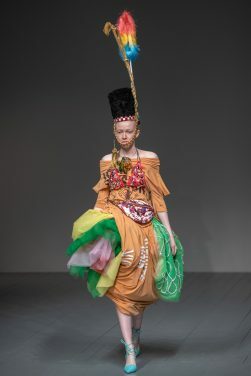 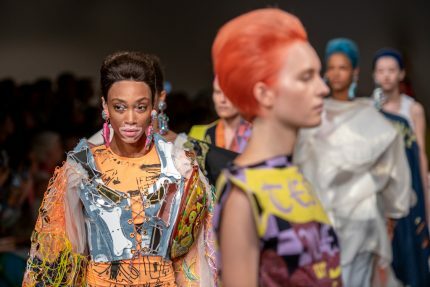 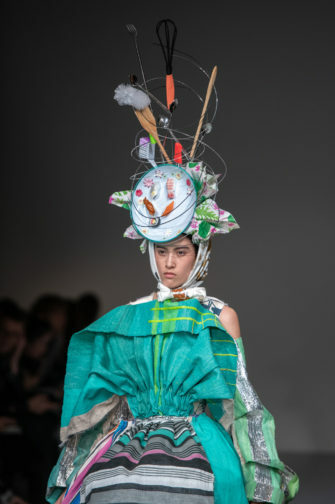 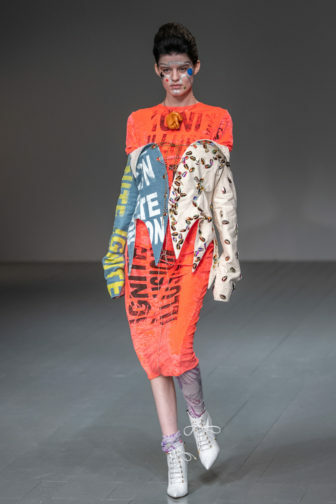 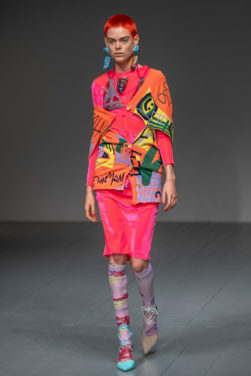 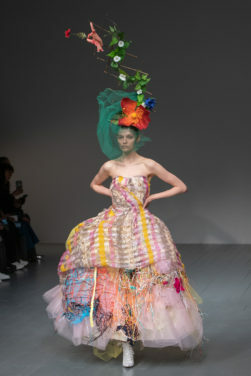 Voluminous tulle skirts in striking neons, boilersuits and outlandish dresses (for want of a better name, “wearable art” would do the trick), went into a head-on collision with everyday household items – pipe cleaners, things you would find in the garden shed. 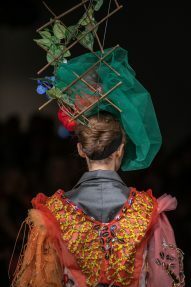 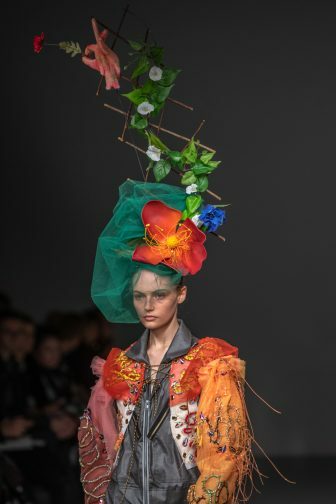 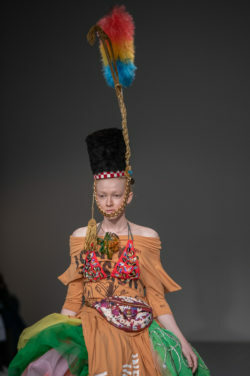 The show was an assault on the senses, enhanced by over-the-top headdresses (provided by legendary milliner Stephen Jones, no less). 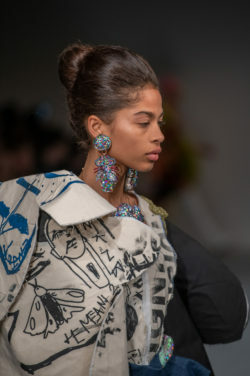 Structural crinolines were decked in detailing overload. 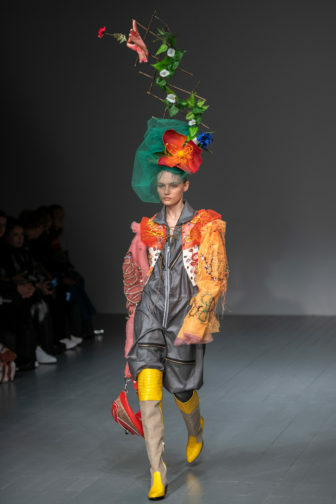 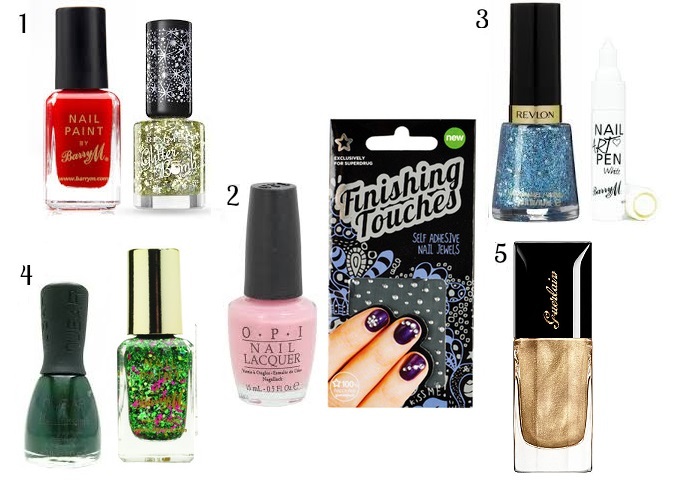 It was colour on top of colour, more is more, and then throw a bit more into the mix. 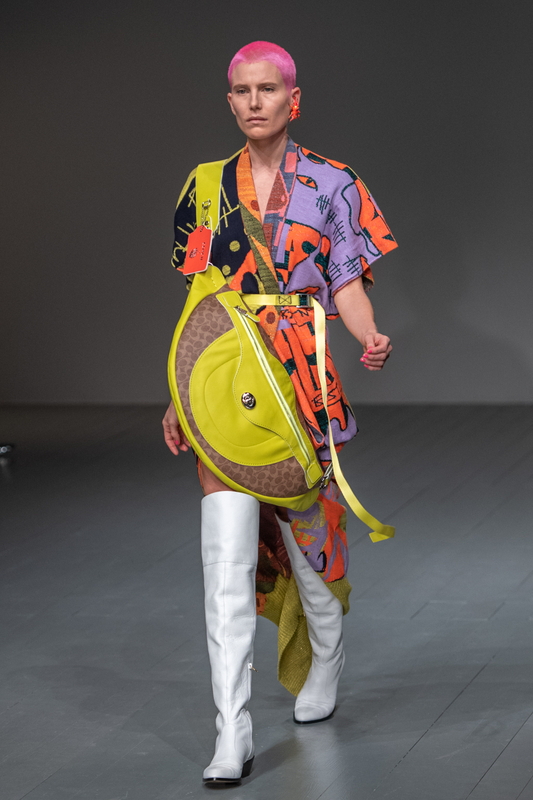 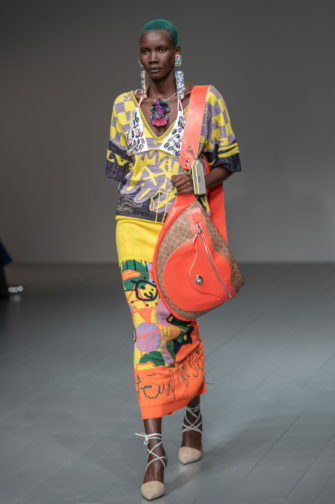 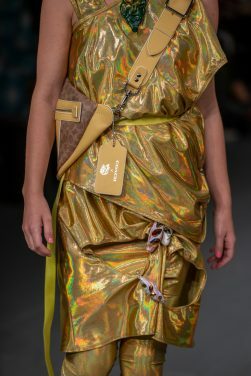 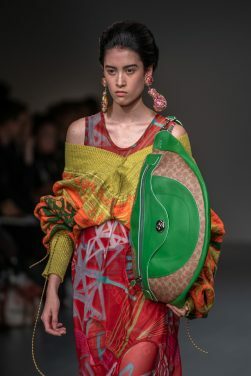 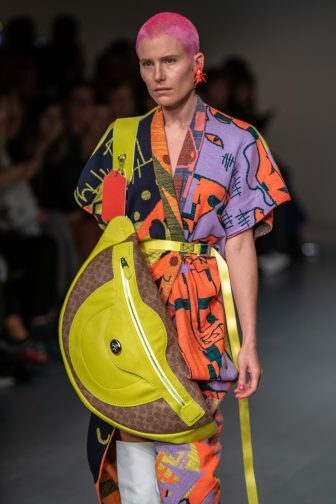 Everything was supersized – including one enormous bumbag slung across the body, a debut collaboration with Coach. 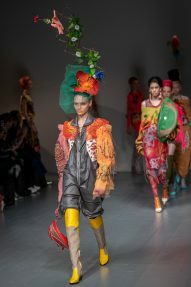 In fact, Bovan pushed the concept of proportion to whole new levels to almost surreal effect; some looks took you on a trip to Wonderland. 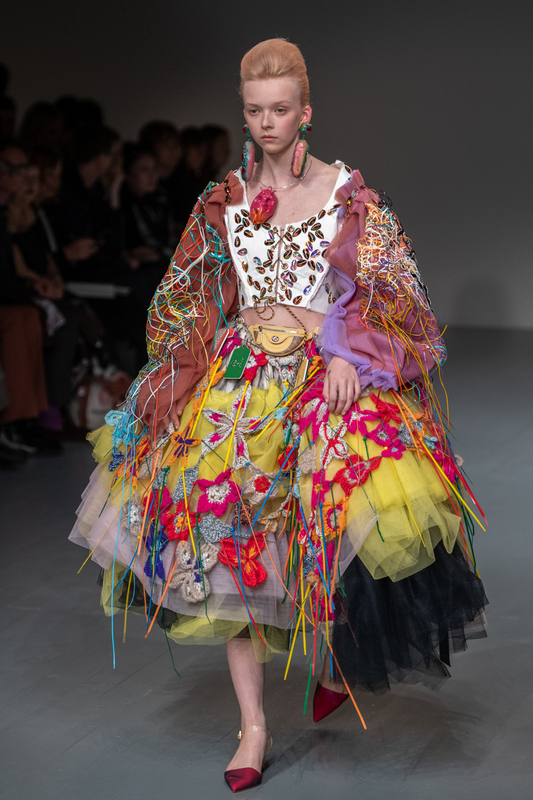 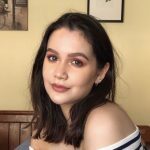 On the other hand, only the keenest of observers could spot the teeniest of bumbags perched across one midriff, swamped by an explosion of silly string yarns, bunches of tulle and embroidered flower patches. 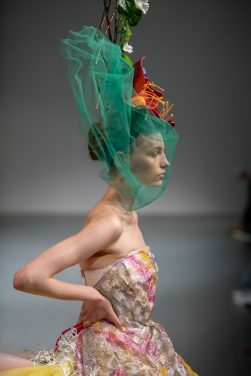 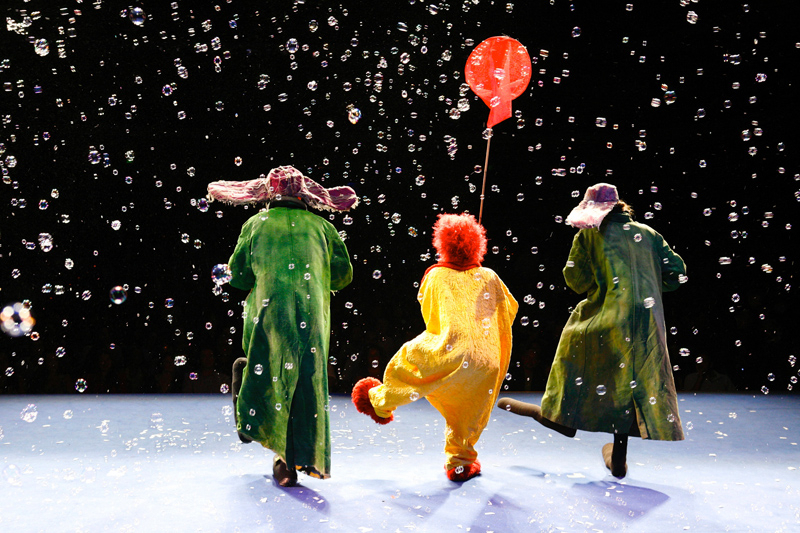 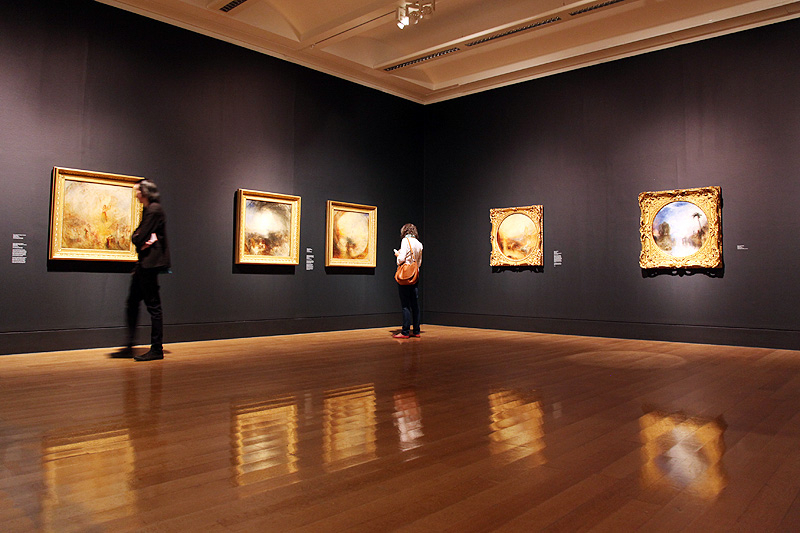 The collection was a paradox: almost silly but actually rather intellectual; surreal but making use of the everyday. 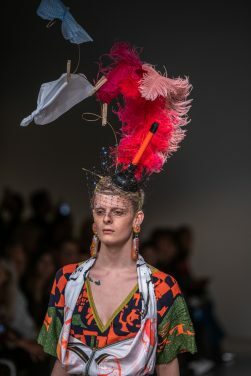 The mentality of Matty Bovan sticks in the mind.